The iPod has lots of uses: music and movie player, photo album, contact and calendar organizer and military tool? The U.S. armed forces are deploying the iPod touch to troops stationed in Afghanistan and Iraq for use as translation tools and for “networked warfare” linking soldiers to each other and to weapons systems and intelligence sources reports Newsweek. According to the story the iPod touch has become the gadget of choice for analyzing data from satellites, drones and ground sensors and can even be used to show villagers a video message of a relaxed and respected local leader encouraging them to help root out insurgents. Vcommunicator produces spoken and written translations of Arabic, Kurdish and two Afghan languages. It also shows animated graphics of accompanying gestures and body language, and displays pictures of garments, weapons and other objects. BulletFlight is a military-grade ballistics calculator that feature built-in profiles for common military rifles and a bullet database of most major brands. 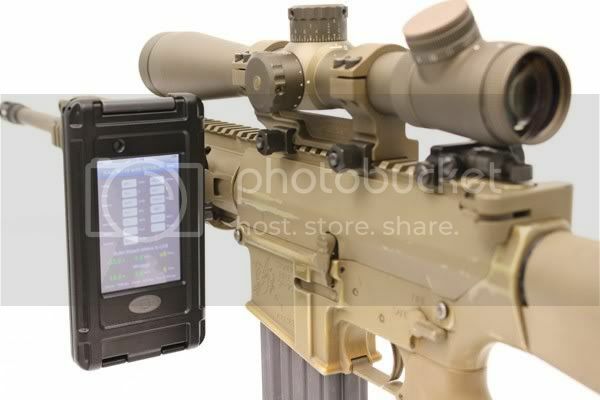 Pictured: US Army M110 Sniper Rifle with iPod touch running the BulletFlight. Courtesy of Engadget.